Pork steak is a cut of meat taken from the shoulder portion of the pig, and the meat from this area can be fairly tough. For this reason, marinating the meat before you cook it is one way to make the meat tender and easier to eat if you aren't using a slow cooking method. Pork steak should be marinated for at least 4 hours for the best results, but marinating the meat for more than 24 hours can cause the meat to break down and should be avoided. 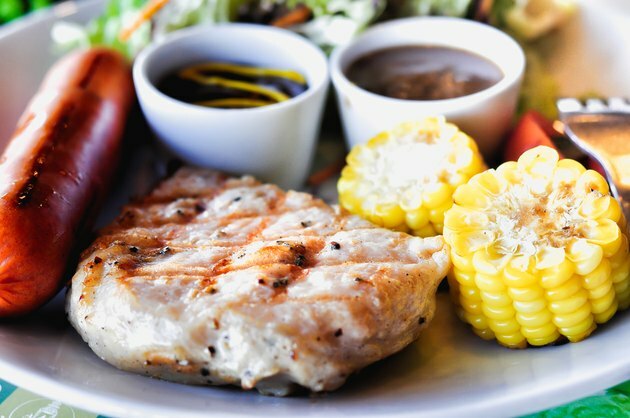 Take the pork steak out of the refrigerator and rinse it with cool clean water to get rid of any bacteria that may have collected on the surface of the meat. Place the pork steak in the bottom of a large food storage container with a tight-fitting top. Brush the pork steak with vegetable oil or extra virgin olive oil and season the pork steak on both sides with kosher salt and freshly ground black pepper to taste. Add 1 cup of water and 1 cup of orange juice to the container. Stir the mixture and toss the pork steak to fully coat them. The pork steak should be completely submerged in the marinating liquid. Place the top on the container and put the pork in the refrigerator for at least 4 hours or overnight. Take the container out of the refrigerator and allow the pork steak to drain in a colander for five minutes. Pat the pork steak dry with paper towels, discarding them as you go until the meat is completely dry. Cook the pork steak as desired. You can use any type of slightly acidic, sweet liquid to tenderize meat. Cola, pineapple juice and citrus juices are commonly used but should be diluted to avoid completely breaking down the muscle fibers. If you do want to use highly acidic liquids like red wine or balsamic vinegar, dilute it with water at a ratio of three parts water to one part acid. You can add fresh or dried herbs to the marinade for more flavor if you wish.